Arthur Fitzwilliam Tait (1819-1905), American Speckled Brook Trout, 1864, oil on board. Carl Otto Kretzschmar von Kienbusch (1884-1976, Princeton class of 1906) was a successful businessman and friend to the Princeton University Library. In particular, Kienbusch donated an extensive collection of books, manuscripts, and other works relating to angling. In among the reels and tied flies are some amazing paintings and drawings, including Arthur Fitzwilliam Tait’s American Speckled Brook Trout, seen above. When Tait immigrated to America in 1850, he was already a practicing lithographer and illustrator. His was also an enthusiastic amateur naturalist. In his spare time, Tait hiked the Adirondack Mountains; camping, hunting, and painting in a summer studio he built. Tait produced thousands of paintings, most often romantic depictions of sportsmen and outdoor life. 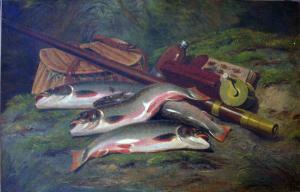 It was his still life of a brook trout that first caught the attention of Currier & Ives, who commissioned the elaborate “American Speckled Brook Trout” for a commercial print. Tait became one of their favorite free-lance artists, producing over forty-two designs for print reproduction. These prints sold for anywhere from 5 cents to $3.00, depending on the size and coloring. Tait wisely sold only the rights to the design and kept the oil paintings for himself, to be sold separately. 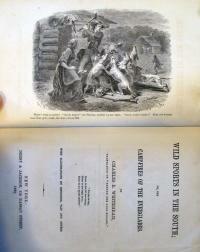 Around the same time as this painting, Tait designed the frontispiece for Charles Whitehead’s “Wild Sports in the South,” which was engraved on wood by N. Orr & Company. by selling codlins, hot, hot, hot. tho’ her codlins were not, she felt herself cold. to fetch for herself a quartern of gin. 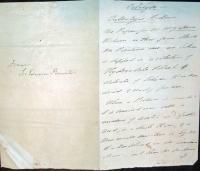 Princeton is also fortunate to also hold a songbook owned and signed by Grimaldi, seen below. 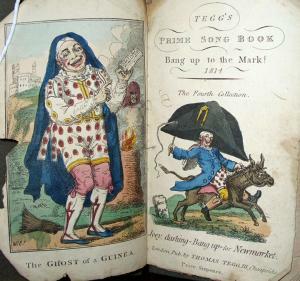 Thomas Tegg (1776-1845), Tegg’s prime song book, bang up to the mark! :the fourth collection (London: T. Tegg, [1814?]). Frontispiece and title vignette by Thomas Rowlandson. 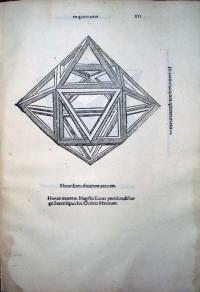 Rare Books (Ex) PR1188 .T43 1814. 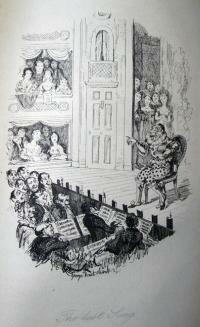 Continue reading Pantomime Actor Joseph Grimaldi. 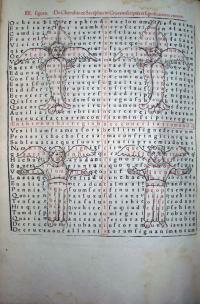 Three leaves from a Biblia pauperum, Schreiber edition X (38-40, .s, t, v.), late 1460s. Hand-colored woodblock prints. Sheet size 27 x 41 cm. GC110 Book Leaves Collection. Princeton’s historical leaf collection holds three leaves from an edition of the Biblia pauperum, one of the best-known of the fifteenth-century blockbooks. According to Nigel Palmer’s article in the current Journal of the Printing Historical Society (no. 11, 2008, Firestone Z119 .P95613), the Biblia pauperum was “an ensemble of texts and images which narrated the history of man’s redemption from the Annunciation through to the Last Judgement and the coronation of the blessed soul in heaven” represented in 40 plates. During the 1460s, the 40 woodblocks for this volume were recut three times, along with seven intermediate issues in which just some of the blocks were replaced. Mr. Palmer examined the sheets in Princeton’s collection and wrote that he believed they belong to the edition X, “almost certainly printed in Germany”. Of the known copies of this edition, Palmer identified one in Blackburn, England, originally from Gotha, which lacks these numbers and might be a match for our leaves. The three leaves shown here are anopisthographic (printed on one side). Two of the sheets have been pasted together to form recto and verso of one sheet. Because there are so few Biblia pauperum surviving in their original structures, it is difficult to be certain about their construction but several editions were sewn into single-quire volumes in chancery folio (approximately 310-20 x 440-50 mm., only slightly larger than Princeton’s sheets). Blockbooks were made from about 1450 to the 1470s, and Palmer cautions us to regard them as intertwined with all experimentation in printing technology of the period, included single-leaf woodcuts, single-leaf metalcuts, single-leaf engravings, books and single leaves with text printed with moveable type, and books with typographic text and woodcut illustrations. Divine Proportion, or the golden ratio, is the ratio a : b = b : (a + b). 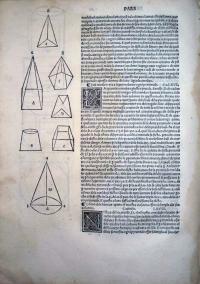 One of the many remarkable things about this edition of Euclid is the expert printing. Each of the colors were printed from separate plates that had to be expertly registered; that is, positioned so that the geometric angles of the didactics matched exactly. The printing was done by Charles Whittingham (1795-1876), nephew to Charles Whittingham, founder of the Chiswick Press where elaborately illustrated editions were published. Whittingham the younger joined his uncle’s business and quickly perfected the specialty of overlaying the printed image from several blocks. The book was exhibited in London at the Great Exhibition of 1851 and both Euclid and Oliver Byrne, an otherwise unknown mathematician, took a backseat. 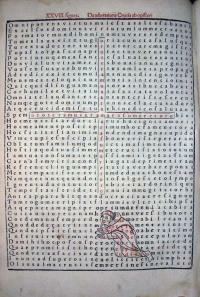 Praise was researved for the beauty of the composition and the artistry of the printing. 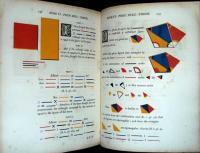 The book was sold by William Pickering for the extravagant price of 25 shillings, placing it out of reach of the simple educators who were suppose to have benefited from this new system for learning geometry. 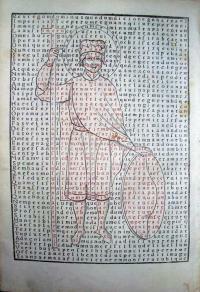 Rabanus Maurus (784?-856), the Archbishop of Mainz, was one of the greatest writers of the Carolingian age. Rabanus compiled an early encyclopaedia, wrote commentaries on the Bible, and devised a complicated system of coded poetry, shown here. 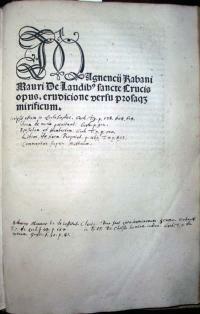 Princeton’s Magnencij Rabani Mauri De Laudib[us] sancte Crucis opus begins with an introduction by Jakob Wimpheling (dated 1501) and includes 30 full-page poems printed in red and black, followed by a transcript in ordinary type for the sake of clarity and a Declaratio explaining the whole ingenious arrangement. The encrypted poems are composed in a grid of 36 lines each containing 36 letters. 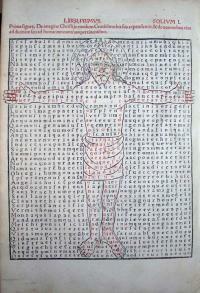 Rabanus sometimes incorporated a figure within the grid, creating both a figurative and a literal picture poem. Saint Odilo of Cluny, an 11th-century devotee of Rabanus’s poetry wrote “no work more precious to see, more pleasing to read, sweeter to remember, or more laborious to write can or could ever be found.” Gustav Mahler was also a fan and composed his 8th symphony around one of Rabanus’s poems. Soon after Thomas Maitland Cleland left school, at the age of 16, he taught himself to set type, bought a small Gally Universal, and began making books in his basement. In 1900, he moved to Boston and published under the imprint Cornhill Press, named after the street where he lived. D. B. Updike of Merrymount Press was an early mentor, who provided commissions and endless criticism, leaving Cleland chronically unsatisfied with anything less than perfection. In the 1930s, he made a series of calendar illustrations for the Harris, Seybold, Potter Company of Cleveland Ohio, which manufactured high-quality sheet-fed offset lithographic printing presses. The company tried to convince the printing world that sheet fed-offset presses could produce quality 4-color process work and Cleland’s prints were meant to provide the proof. 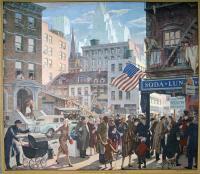 “God Bless America,” seen below, is one of these prints. One of his most complex projects was Jonathan Wild, seen above, printed under Cleland’s supervision by the Marchbanks Press and published by the Limited Editions Club. In a letter to editor George Macy in 1942, Cleland wrote, “I am anxious to have this large line drawing photographed for the plate so … I should have proofs of the plate on which I can paint in the color for each stencil … so that they will have only the actual coloring of the edition to do after the book is off the press.” The coloring was accomplished by Charlize Brakely, who charged $10 per thousand pages. The book has 30 pages with color in an edition of 1,500, so that means a total of 45,000 pages to color. 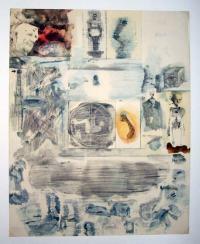 The Graphic Arts division is fortunate to hold a set of publisher’s proofs for Rauschenberg’s print edition of XXXIV Drawings for Dante’s Inferno, published in 1964 by Harry Abrams. 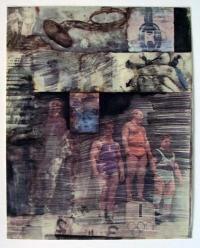 This collotype portfolio reproduces the 34 drawings in the collection of the Museum of Modern Art in New York. 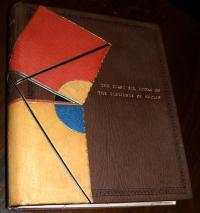 A great source of information about the Dante project and many of Rauschenberg’s other works of art is Mary Lynn Kotz’s Rauschenberg, Art and Life, revised 2004 Marquand Library SA ND237.R187 K679 2004. I am writing to ask you to support H.R. 5889, *The Orphan Works Act of 2008*. The bill addresses a problem under copyright law that stops copyrighted works from being used when their owners cannot be found. These works are called “orphans” and there are millions of them that go unused today because filmmakers, libraries, archives, museums, and publishers are afraid of being sued. Penalties for using an “orphan work” without permission can be as high as $150,000 if the original copyright owner appears. H.R. 5889 allows for orphan works to be used, so long as the user does a “qualifying search” for the owner. In the off chance the original owner surfaces after the search, he is compensated for the use. The bill goes out of its way to prevent “bad faith” users from gaming the system, but is balanced enough to not make it burdensome for the honest users. The bill includes a “Notice of Use Archive,” a limit on how an orphan can be used, and an extra fee just because a work was registered. These sections would add costs and put more burdens on users that would limit their use of orphan works. I would urge you to take out those sections of H.R. 5889. Lastly, H.R. 5889 authorizes services that would let owners upload their photos or other visual works to online databases so that the owners could be found later if someone else wanted to use the work. These services are a good idea, but the bill should be changed to guarantee the public free access to search them, including through Internet search engines. Please support this small but important change to the bill. I urge you to make the above changes to H.R. 5889, and support its passage. The Graphic Arts collection holds a wide selection of optical toys and instruments, from a portable camera obscura to 20th-century Magic Mirror Movies. 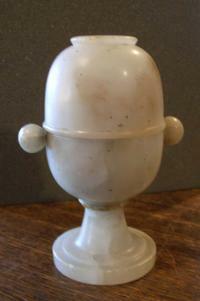 One of the favorite viewing devices in the Victorian era was affectionately known as the Peep Egg. 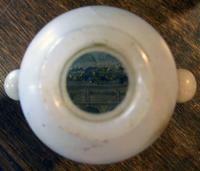 Unlike moving image viewers, such as the phenakistoscope or the zoetrope, this personal viewer allows one person to view one still image through a monocular lens. More complex peep shows or boite d’optique were equipped with many openings and/or moving parts to simulate daytime and nighttime. These viewing eggs were often made as souvenirs for a special event, festival, or exposition. The peep egg is made of alabaster, so that light passes through the body of the device and no other source of illumination is required. The body is fitted with twin alabaster handles rotating a spindle so that two or three prints can be mounted inside the body of the egg. Each person turns the handle at his/her own speed to see each of the images. Princeton’s egg is from London and offers a hand-colored engraving of Greenwich Hospital, another of the Thames river at the entrance to the Tunnel, and a third panel in-between with a small bouquet of dried foliage and crystals. Mister O'Squat by Rowlandson or Lane? Theodore Lane (1800-1828) on the other hand, was a lesser known British caricaturist who worked around the same period as Rowlandson. A savant, who had his debut at the age of 16 with an exhibition of paintings at the Royal Academy, Lane is only known today for his humorous work, such as his caricatures of George IV. The graphic arts collection holds a scrolling panorama made up of 12 unsigned, hand-colored etchings, with a narrative in verse, attributed to Rowlandson and titled Mister O’Squat. 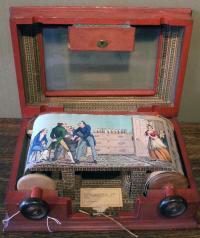 This year, a search for more information about this item uncovered an unbound series of 12 panoramic colored prints that were sold in a 1906 book sale under the title Mister O’Squat and the Widow Shanks. This title corresponds to a listing in OCLC for a series of prints with verse attributed to Lane and titled The Misadventures of a Pair of Newlyweds who Leave the Country for the Superior Pleasures and Society of London, also called Mister O’Squat and Widow Shanks. 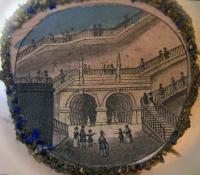 Published in 1818, this is also a panorama in 12 sections, each 13 x 73 cm. the same as Princeton’s. Were these prints just reconfigured to be viewed as a continuous scene through the window of a small box (sometimes called a myriopticon)? 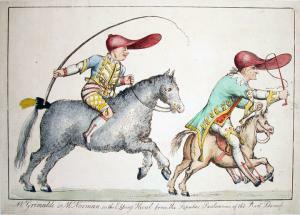 Did Rowlandson know of Lane’s prints and reproduce them for the publisher William Sams? Is the 1818 series misattributed to Lane and really the work of Rowlandson? These are still unanswered questions that deserve further research before an answer is given. 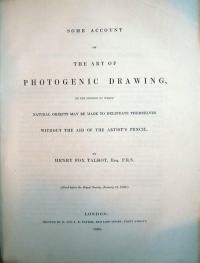 In January of 1838, news reached William Henry Fox Talbot (1800-1877) in London that Louis-Jacques-Mandé Daguerre (1787-1851) had announced his direct positive process to the Academy of Sciences in Paris. Talbot rush to present and publish his own findings and on January 31, Talbot read a brief paper before the Royal Society in London. Several weeks later, he spoke again at length about the process that he called photogenic drawing. Unfortunately, the Society declined to publish his research on photography in their Transactions and it was not until the following year that the paper found its way into print (shown here). This brochure constitutes the first separate publication on photography. Inside the copy held at Princeton University is a letter from Sir Edward Brewster (Principal of St Andrew’s University and Chancellor of Edinburgh) who was an amateur photographer and writes about the calotype process. It was not until 1841 that Talbot finally introduced the calotype process. 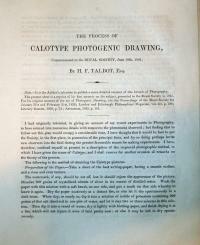 Talbot again spoke to the Royal Society and the document pictured here is the publication of this “memoir” or talk presented on the creation of photography. Princeton University holds many seminal publications on the history of photography from around the world. Also pictured here is the 1851 paper published by Louis Désiré Blanquart-Evrard (1802-1872), introducing his variation on the calotype entitled Traité de photographie sur papier. Continue reading Early History of Photography. 2008 is John Milton’s quatercentenary. As one of many events celebrating the author this year, Professor Nigel Smith spoke Thursday at Labyrinth Books on his new book, Is Milton Better than Shakespeare? Professor Smith pointed, in particular, to Milton’s ability to merge poetry with conversation and urged audience members who were not convinced to simply read Paradise Lost. 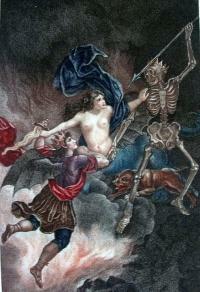 Pictured here is the first edition illustrated in color: Le Paradis perdu (Paris: Chez Defer de Maisonneuve, 1792). Graphic Arts division (GAX) Oversize PR3561.F5 D8 1792q. 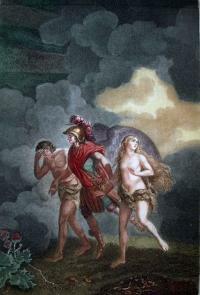 For this edition, Frédéric-Jean Schall (1752-1825) created a series of paintings specifically to be used as designs for engraved illustrations to this bilingual edition. Twelve stipple engravings were printed à la poupée, that is, with hand-painted application of colored inks to sections of the copper plate before printing. Each sheet had to be inked and printed separately, significantly limiting the edition’s print run, but adding enormous beauty and charm to the volume. In the early years of the 20th century, the publishing house known as Tolmer et Cie or Maison Tolmer was located at 15, quai Bourbon in Paris. 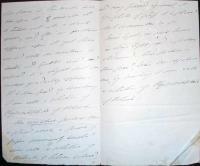 The editor in chief was Alfred Tolmer, who took over after his father, whose name does not seem to have been recorded. Alfred’s son Claude Tolmer (1922-1991) was also with the firm and Bernard Tolmer is also mentioned. These three generations of Tolmers produced literally hundreds of beautiful volumes with exceptional design, often illustrated with original pochoir or lithographic prints. See Papillons in a previous blog post. In 1930, Alfred began to write his definitive treatise on graphic design, entitled Mise en Page: the Theory and Practice of Layout, which continues to be consulted, if only for the inspirational layout of this book alone. The volume deals with photography, typography, and illustration, using unusual techniques of collage, pochoir, and coated papers. He published a French language edition himself and an English language edition with The Studio magazine, which was printed in London and includes the French text at the back. Continue reading Mise En Page.